Automatically destroys the foes current pokemon. This attack can only be used once per battle. 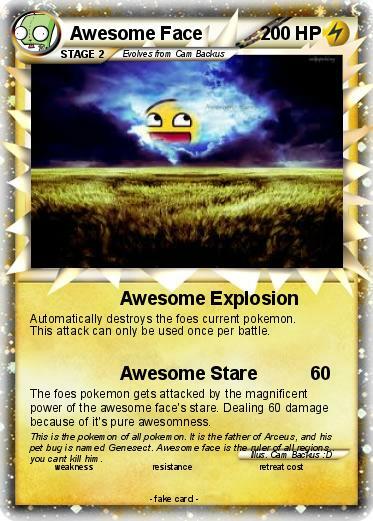 The foes pokemon gets attacked by the magnificent power of the awesome face's stare. Dealing 60 damage because of it's pure awesomness. Comments : This is the pokemon of all pokemon. It is the father of Arceus, and his pet bug is named Genesect. Awesome face is the ruler of all regions.. you cant kill him.